The CYMK conspiracy is a GameJam game that I made for the 'A Game By Its Cover' 2018 jam where you had to use a cart image from Famicase 2018 and make a game based on that. Since I'm currently working on multiple other projects, I've decided to take one called CYMK: The Game, which sounded like it was a color-based puzzler. 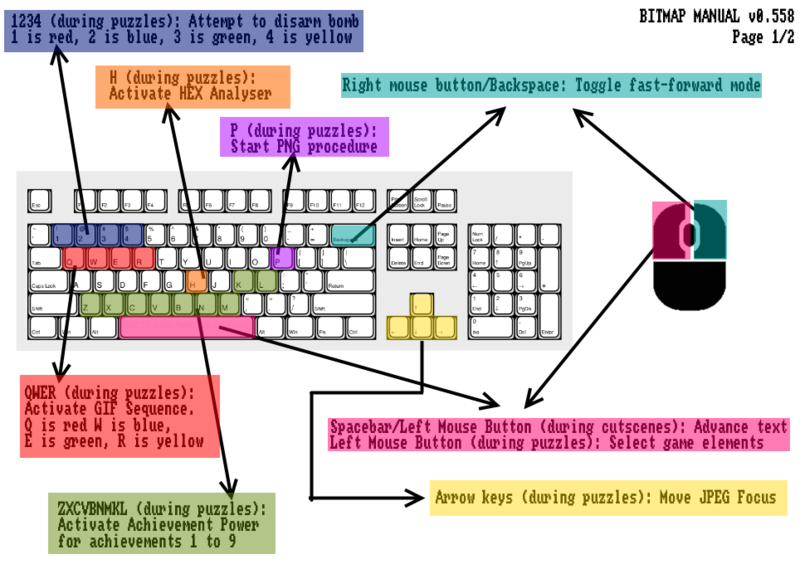 This inspired me to make a puzzle game where you would disarm bombs by picking the right color. I wasn't too sure what to do with the idea at first, but a few mechanics came to my mind and I iterated on them through the few hours I spent on this game. I also decided to add visual novel elements where instead of just doing the puzzles straight-on one after another, a little story would unfold. I did a bunch of balance tweaking over time, making sure everything wasn't too easy or too hard, and now you can go through the 32 levels just fine and collect a few achievements. There are a few things I would add or change if I had given myself infinite time, like having special bombs disabling certain parts of your bomb-solving computer or requiring different tasks to be completed, but otherwise I'm pretty okay with the result. It's just a UI game (I am infamous for my UI games) and it's one straight storyline with very few choices, but for a 16 hour game, it works. 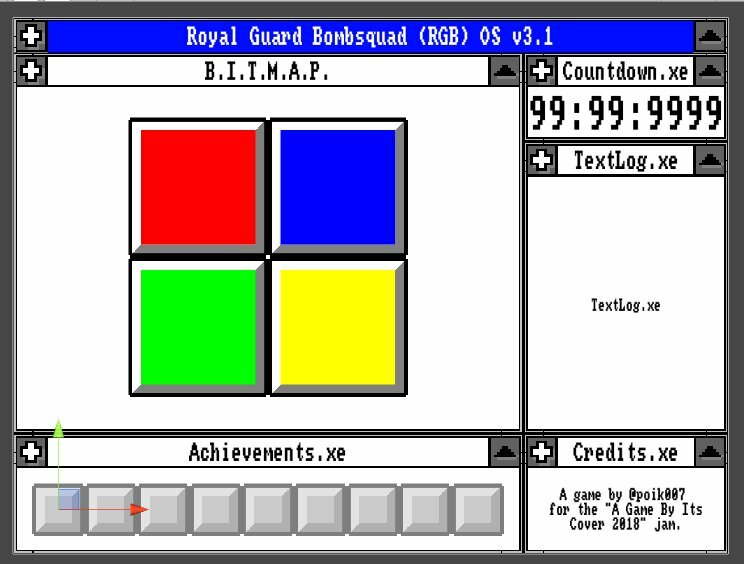 The core mechanic of the game is about picking up the right color from Red, Blue, Green and Yellow in order to disarm each bomb. In order to do that, you have four tools at your disposal; PNG, JPEG, GIF and HEX. Each of these tools become less and less useful as the game goes on, so you need to use them altogether. PNG is a simple fire-and-forget tool, you use it, wait a while, and it gives you a color alongside a percentage of confidence. For very simple bombs, you'll get a good result after one or two uses, but it becomes less useful as the game goes on. JPEG has you 'walk' around a simple grid trying to pinpoint the location of some energy signature. The directional buttons blink to indicate in which direction you should go and when you find your destination, the middle box blinks between two colors, this is useful to narrow down the answer. GIF shows you a list of bars of different lengths representing audio pitches. You can play a series of notes and try to find which color matches the pattern shown. HEX shows a grid of hexadecimal values and you scan them to find clues about the right color. There might be a ton of garbage data here and not everyone grasps hexadecimal, but it's a useful tool. There are also nine achievements to get, done by exclusively using certain tools, taking certain decisions in the story or just by incredible luck.